The BodyBlaster is ideal for many costuming and wearable applications. 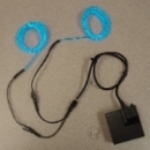 For an additional charge of $3.50 per unit, the wire can be upgraded to the brighter 2.6mm Polar Bright 3 wire in the following colors: BLUE, BLUE-GREEN, ORANGE, PINK, or YELLOW. The inverter has both a continuous and a variable (adjustable) blink rate that ranges from slow-blink to strobe. The inverter's dimensions are a small 2.5" x 2.5" x .75" Weight: 3 oz., and comes with a belt clip. The BodyBlaster uses 1 replaceable 9 Volt Battery, and Battery lasts for up to 15 hours of continuous use.